The King's Church, Wisbech: Messy Fun at Messy Church! This was our sixth messy church and the theme for this month was not to worry for God takes care of us. 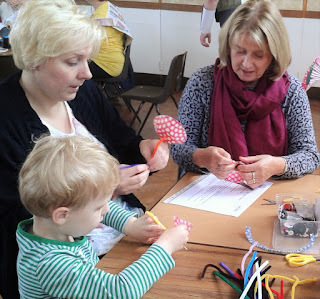 Everyone who came enjoyed the activities especially making hats and garments from junk .Some had fun making a bird feeder mixing lard ,cheese,bird seed and raisins together. 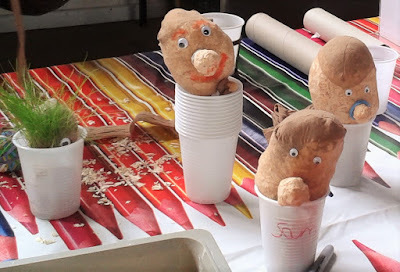 Another activity was making a grass head,filling a pop sock with some grass seed and then sawdust to take home and water and watch the grass grow to make hair,after an hour of activities we all came together for a short celebration where some of the children had bubble wands and made bubbles Mike spoke about how as the bubbles fly away we can give God our worries and he will help us,then we all had a meal of hot-dogs coleslaw and then strawberries and shortcake a good time was had by all.